Alice, also known as “black Alice” or “Alice of Dunk’s Ferry,” lived as a slave in Philadelphia for the entirety of her 116 years. 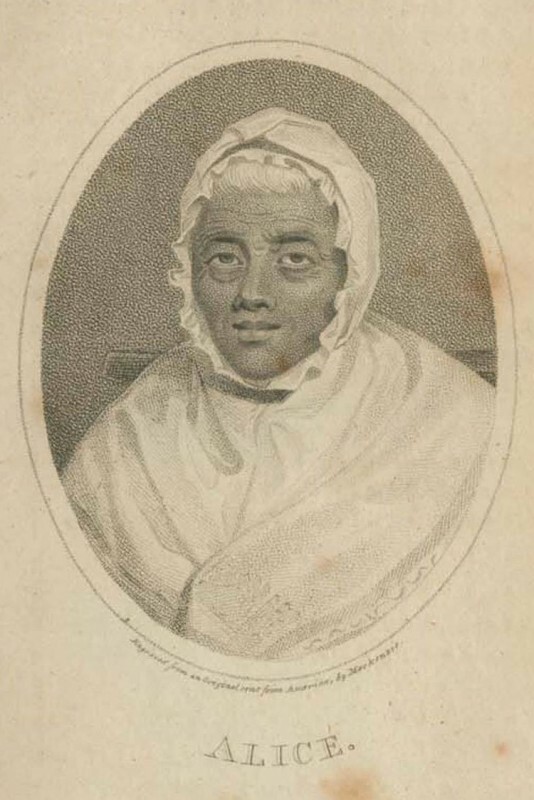 This image is an engraving, probably part of a larger book by Thomas Isaiah, “Memoirs of Remarkable Female Characters, Ancient and Modern” or more commonly known as “Eccentric Biography,” published in 1804. Aside from the extraordinarily long life that marked her notable in the eyes of Thomas, Alice led a relatively normal life for a Philadelphia slave. For the majority of her life, Alice collected tolls to cross the river on Dunk’s Ferry, located in the present day at the end of Dunk’s Ferry Road on the Delaware River near Bristol. 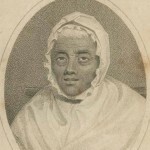 However, she is remembered as one of Philadelphia’s first oral historians. In her time Alice kept the chronicle of Philadelphia’s persons, places, and events in her memory. She lived from 1686 until 1802 and during her lifetime saw the transformation of Philadelphia from a rural forest, to a burgeoning metropolis, to a revolutionary hotbed, to the young capital of a new nation. It is likely that many of the children and grandchildren of Philadelphia’s first settlers sought out Alice to hear stories of their ancestors and the events that took place around them. However, for many years that followed, voices like Alice’s were far less prominent in history than those of men such as William Penn, Benjamin Franklin, and George Washington. Inspired by the interpretation of slavery at the President’s House site in Philadelphia, Christ Church (Second and Market Streets) developed programs to allow Alice’s voice be heard once more. During her lifetime, Alice was an active member of Christ Church’s congregation and is documented as having ridden on horseback to mass every Sunday through her nineties. Her acute memory recalled when the now-historic church was just a wooden building in which she could touch the ceiling. In recently developed programs, interpreters at Christ Church costumed as slaves perform a mini-drama that narrates real stories of Black Alice and speaks to other topics on slavery in Philadelphia. Through the work of historic interpreters at sites such as Christ Church and the President's House, Philadelphians are working to retell history and recognize that the voices of slaves are crucial in telling the story of the United States. This lithograph by Kennedy & Lucas depicts the London Coffee House as it stood in 1830. Once located at the southwest corner of Front and Market Streets in Philadelphia, the London Coffee House was more than just a place to get a drink. 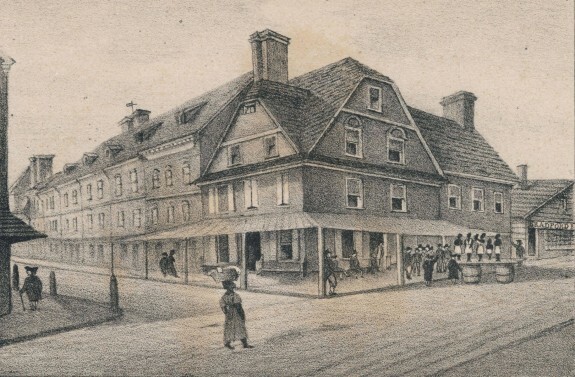 Owned by printer and entrepreneur William Bradford, the London Coffee House served as a center for economic transactions in early Philadelphia. 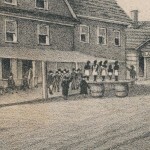 In this image an auction block with slaves standing upon it is visible outside the Coffee House. For colonial Philadelphians, this would have been a common sight. The first slaves arrived in Pennsylvania in 1684 when the Isabella docked and disembarked slaves not far from the London Coffee House. The sale of human beings was just one of the many routine business transactions at the Coffee House. 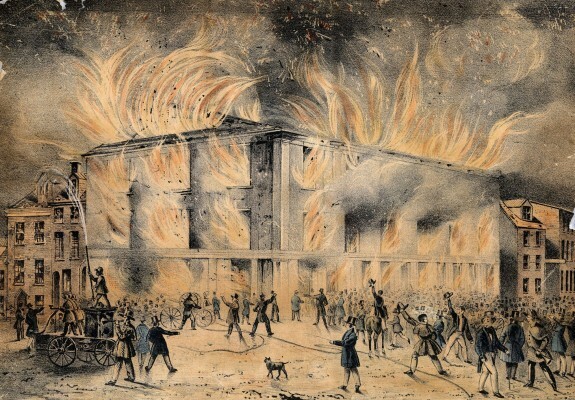 On a spring night on May 17, 1838 at the corner of Sixth and Haines Streets, almost sixty years after the Gradual Emancipation Act, Pennsylvania Hall (erected 1837-1838) burned to the ground at the hands of a large crowd. Constructed as a place for local abolitionist groups to meet, the dedication ceremonies began on May 14 amidst swarming, angry crowds that eventually burned the building down on the evening of May 17th. The building was allowed to smolder. 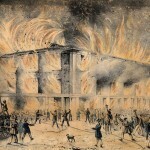 Although firefighters were on hand to control the blaze, they chose to save surrounding buildings and let the Pennsylvania Hall perish. A few days after the fire John T. Bowen, a local printer, issued this image. Known as the Philadelphia Riot, the incident at Pennsylvania Hall demonstrated the lack of support for abolition in the city of Philadelphia though legislation for its graduate abolition had been enacted more than half a century earlier. 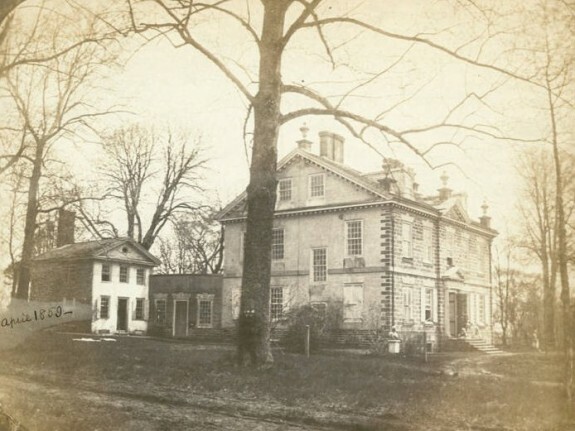 Cliveden, located in Germantown and shown here in April 1859 in a photograph by F. De B. Richards, is well known as the site of the Battle of Germantown and also as the summer home of the Chew family. Until recently, like many historic house museums in America, a typical tour of Cliveden focused on a wealthy white family, their lives, property, and fine things. However, on July 4, 2012 Cliveden, debuted a new project, Emancipating Cliveden, and exhibit, “Life, Liberty & the Pursuit of Happiness?” In an effort to rewrite the history of Cliveden, the narrative has shifted away from the Chews to the lives of the many slaves and servants that who took care of the family and their properties. This new view of Cliveden's history identifies the Chews primarily as slaveholders and describes their participation in the management, trade, and sale of human beings. Emancipating Cliveden is one example of how historic house museums are rethinking domestic history and incorporating the lives slaves and servants. The attention to slaves at Cliveden recognizes slavery as a broader American story that has until recently been left largely untold. More than this, Cliveden presents slaves as individuals with independent thoughts and freewill. The incorporation of slavery at Cliveden was ten years in the making. In 2000, the Chew family began to inventory and describe a trove of correspondence, account books, photos, receipts, journals, recipes, inventories, maps, and other archival material. To fully complete their records, the Chews even sought out and bought back groups of papers that had been lost or sold in the nineteenth century. 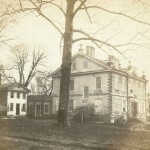 The Chew papers eventually found a home at the Historical Society of Pennsylvania where they continue to be a wealth of information about slavery in the Philadelphia area and the development of African American community. With help from many sources including Historical Society Pennsylvania and the National Endowment for the Humanities, in the early 2000s the monumental task of sifting through several hundred years of papers began. Unearthed in this process was evidence of the Chews’ participation in slavery long after Pennsylvania enacted the Gradual Abolition Act of 1780. Benjamin Chew however, circumvented the law by sending all women of childbearing age and most young men out of the state to Delaware, where slavery remained legal. The Chews sent and received many letters from overseers running their Maryland and Delaware plantations on topics ranging from acquiring clothes and shoes for slaves, to requests for advice on how to handle repeatedly disobedient or lazy slaves. While slavery dwindled in Philadelphia for the Chews, it thrived in their outlying plantations until the mid-nineteenth century. 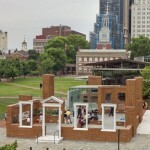 In the first decade of the twenty-first century, the President’s House at Sixth and Market Streets attracted new attention and instigated change in the common perceptions of slavery in Philadelphia and in American memory. After much debate and years of planning, the site of the George Washington’s mansion became a place of commemoration of the legacy of nine enslaved Africans and their continued struggle for freedom in the shadow of an emerging reputedly equal nation. Like many Philadelphians, Washington found ways to circumvent the Pennsylvania Law for the Gradual Abolition of Slavery. This law stipulated that slave children born after 1780 were to be freed at the age of 28. Slaves born before 1780 could remain enslaved in the state their entire lifetime and no slaves from another state could be legally brought into the state for more than six months. Washington lived in Philadelphia from 1790 to 1797. In order to keep his Virginia residency and thus his entitlement to hold slaves, Washington was careful that neither he nor his slaves spent the six continuous months in the state necessary to establish legal residency. 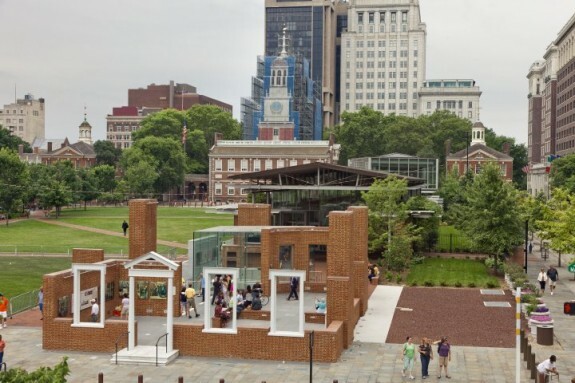 Slavery and the slave trade were central to the history of eighteenth- and nineteenth-century Philadelphia as the region economically benefited from the institution and dealt with tensions created by slave trading, slave holding, and abolitionism. Early Philadelphia, an Atlantic trading hub, became both a focal point for the slave trade and a community of enslaved Africans. Slaves created their own family and social networks while simultaneously integrating into white Philadelphia, shaping the political, economic, and social course that the region took into the nineteenth century. Slave labor was integral to the region even before William Penn (1644-1718) founded Pennsylvania. New Sweden colonists, whose settlement from 1638-1655 centered on present-day Wilmington, Delaware, and extended throughout the lower Delaware Valley, imported the first African slaves in the mid- to late seventeenth century. After Penn founded his colony, slavery continued to be integral to the infant city of Philadelphia and its environs with the first slave ship arriving in Philadelphia itself in 1684. Slaves filled labor needs in many occupations as the region developed a diverse economy. Colonists in New Jersey and Delaware utilized slavery in essentially the same ways, though planters in central and southern Delaware used slaves to grow tobacco, wheat, and other commodities. The presence of indentured servants in the colonial period created a hybrid labor system in which the region’s indentured white laborers, free wage laborers, and slaves worked alongside each other. This system created flexibility for meeting labor needs as labor costs and supply fluctuated throughout the colonial period. Masters routinely hired out their slaves, which further added to the labor system’s flexibility and the regional impact of slavery. The hiring-out system allowed slaves to move throughout the region on long and short term contracts to various masters. Native Americans were occasionally among the enslaved until at least the middle of the eighteenth century, but most enslaved people were Africans or African descendants. By the 1710s, race-based slavery had developed and European colonists rationalized slavery by seeing Africans as barbaric, heathen, and therefore eligible for enslavement. Through Philadelphia’s port, like in other colonies, these ideas of race and slavery came into the region as merchants and sailors participated in the growth of Western slavery and the slave trade. By 1710, slaves constituted almost twenty percent of Philadelphia’s population; while the number of slaves increased until just before the American Revolution, reaching 1,375 in 1770 or just over eight percent of the total population. The slave trade represented a major part of the Philadelphia region’s relationship to the Atlantic world, the networks formed by trade, migration, and political associations between Europe, Africa, and the Americas. Slave ships outfitted in Philadelphia traveled to the West African coast to trade for slaves, though the majority of slaves who entered the region did not come from Africa directly. Most came after living for several years in the Caribbean with their masters or on slave ships whose masters had purchased them in the Caribbean for sale in the smaller North American market. These largely West African slaves filled labor shortages in the Philadelphia region, especially when disruptions limited the supply of indentured laborers. For example, when the Seven Years’ War interrupted the flow of indentured laborers, the Philadelphia region imported almost 1,300 slaves in a nine-year period, including many directly from Africa. By 1767, fifteen percent of Philadelphia households owned slaves. However, the slave trade to the region largely ended when Pennsylvania levied a high duty on imported slaves in 1773 in response to fears of slave revolt as well as calls to end the most horrid part of the institution of slavery. Most other colonies had also begun to limit or prohibit the slave trade by the beginning of the Revolution for similar reasons, including New Jersey and Delaware, a trend which continued when all but South Carolina and Georgia banned the trade in the aftermath of the Revolution. Philadelphia’s enslaved men and women, as part of the region’s hybrid labor force, toiled for masters who in most cases owned only one or two slaves, which limited their ability to interact with other slaves. These small holdings also increased the masters’ ability to control most of their daily routine and limited the development of slave families and a distinct culture. Despite these arrangements, slaves managed to establish kinship networks around the city and its environs by interacting with one another in the city’s marketplaces and worship services. Ship captains also routinely used slave labor both in their homes as well as on their ships which allowed these slaves to create extensive Atlantic networks that allowed for an exchange of culture, information, and possibly the tools to achieve freedom. On the other hand, slaves who lived in rural areas similarly established these community networks when they traveled with their masters into Philadelphia to sell at the city’s markets or for other business purposes. These networks allowed enslaved Philadelphians to develop their own culture, social customs, and exercise their own religion. In this “underground” world beyond the control of white masters, slaves interacted with each other on a daily basis, forming romantic relationships, sustaining African cultural institutions, and maintaining family connections across long distances. This also allowed slaves to organize in resistance to the institution and advocate for abolition in the late eighteenth century. Though early historians portrayed slavery in the North as benign, physical force and violence always mediated the master-slave relationship in the Philadelphia region. Pennsylvania, New Jersey, and Delaware, like all other colonies, passed strict regulations to govern enslaved labor in the early eighteenth century. These regulations limited slave movement, provided harsh punishment for violent acts against whites, and established rules for general slave conduct. As in the Caribbean and the American South, resistance took many forms, but running away became the most frequent method. Slaves left their owners regularly both as a way to reject their masters’ control as well as to maintain kinship ties with distant families and communities. Discussions of abolitionism developed in tandem with slavery’s increase. In 1688, four Germantown Quakers protested against African slavery, which mirrored Quaker founder George Fox’s (1624-91) questioning of the institution. However, Quakers continued to hold slaves throughout the colonial period as few believed the practice immoral as long as owners treated their slaves fairly and without violence. In 1776, the Philadelphia Yearly Meeting banned its members from owning slaves or face disownment from the Society of Friends. Quakers and non-Quaker allies discussed abolition in the midst of the American Revolution. Abolitionists routinely used the same language that Patriots utilized in their quest for freedom from British “tyranny” or “enslavement” to highlight the hypocrisy of owning slaves amidst a crusade for freedom. In Pennsylvania, this revolutionary rhetoric motivated the state legislature to enact the first legislative emancipation in history: the Gradual Abolition Act of 1780. However, the Act of 1780 freed no slaves immediately. It only provided freedom for children born to slaves after its enactment. These children labored for their mothers’ masters for twenty-eight years and therefore, in effect, paid slaveholders the cost of their own freedom. These children, an entirely new legal category, entered a society that was unprepared to deal with their eventual freedom. This led many slaveholders to treat them as slaves, working, beating, and selling them in the same way as their parents. Slavery, therefore, died a very slow and painful death. After 1780, the presence of slavery continued to be a concern in Pennsylvania as non-resident slaveholders regularly brought slaves into the state. This became even more problematic when Philadelphia became the nation’s capital from 1790 to 1800 and southern members of Congress arrived in the city with their slaves. George Washington, living in the President’s House, brought nine of his slaves with him. As a non-resident, the 1780 Abolition Act allowed Washington and other slaveholders to bring slaves into Pennsylvania for six months before mandating their freedom. Washington and other masters exploited a loophole in a “sojourner law,” which allowed them to continue to hold slaves in Pennsylvania indefinitely as long as their slaves traveled to another state at least every six months. Washington, for example, had his slaves cross the Delaware into New Jersey to restart the six-month limit or sent them periodically back to Mount Vernon. The extension of slavery that sojourner laws permitted led many abolitionists to call for their repeal in the 1830s and 1840s, thereby exacerbating sectional tensions in the years before the Civil War. Slavery in New Jersey remained an important institution after the American Revolution as it provided much of the labor to repair the state’s economy after armies laid waste to the state during the war. By 1790, most of West Jersey (including present-day Sussex, Warren, Morris, Hunterdon, Mercer, Burlington, Salem, Gloucester, Cumberland, Atlantic, and Cape May Counties) was largely free of slavery due to Quaker influence. However, large portions of East Jersey (present-day Passaic, Bergen, Hudson, Essex, Union, Somerset, Middlesex, Monmouth, and Ocean Counties) retained it with some counties counting more than 15 percent of their population as enslaved. Lacking a strong abolitionist presence, New Jersey became the last northern state to adopt a gradual abolition law in 1804. Delaware, on the other hand, discussed gradual abolition but never approved it due to the slave-holding interests in the southern part of the state. However, along with the rest of the upper South, the state relaxed manumission standards and slavery gradually declined in the areas bordering Pennsylvania. By the 1830s, slavery largely disappeared from the region, though because of the terms of gradual abolition it remained legal in Pennsylvania until 1847 and in New Jersey until 1846. Over the next several decades, Philadelphia’s status as a port city and its border with slave-holding Maryland and Delaware attracted increasing numbers of fugitive slaves from the South. Free blacks also risked being kidnapped into slavery to feed the hungry labor markets of Louisiana and Mississippi. Concern over kidnapping led white and black Philadelphians to action. For instance, Absalom Jones, a former slave and leading black abolitionist and minister, helped author a 1799 petition with other free blacks to Congress asking for revisions to the 1793 Fugitive Slave Law. When relief did not come from the federal government, Philadelphia’s Mayor Joseph Watson used city resources in the 1820s to recover slaves and freed blacks kidnapped to the South. This new dimension of slavery continued debates over the institution in the state until the Civil War. James Gigantino is an Assistant Professor of History at the University of Arkansas. He is currently working on a book project on slavery and abolition in New Jersey. Berlin, Ira. Many Thousands Gone: The First Two Centuries of Slavery in North America. Cambridge: Harvard University Press, 1998. Dunbar, Erica. A Fragile Freedom: African American Women and Emancipation in the Antebellum City. New Haven: Yale University Press, 2008. Hodges, Graham. Root and Branch: African Americans in New York and East Jersey. Chapel Hill: University of North Carolina Press, 1999. Jackson, Maurice. Let This Voice Be Heard: Anthony Benezet, Father of Atlantic Abolitionism. Philadelphia: University of Pennsylvania Press, 2010. Nash, Gary. Forging Freedom: The Formation of Philadelphia’s Black Community, 1720-1840. Cambridge: Harvard University Press, 1988. Nash, Gary and Jean Soderlund, Freedom by Degrees: Emancipation in Pennsylvania and its Aftermath. New York: Oxford, 1991. Newman, Richard. The Transformation of American Abolitionism: Fighting Slavery in the Early Republic. Chapel Hill: University of North Carolina Press, 2002. Soderlund, Jean. Quakers and Slaves: A Divided Spirit. Princeton: Princeton University Press, 1985. Zilversmit, Arthur. The First Emancipation: The Abolition of Slavery in the North. Chicago: University of Chicago Press, 1967. Afro-Americana Collection, Library Company of Philadelphia, 1314 Locust Street, Philadelphia. Charles L. Blockson Afro-American Collection, Special Collections Research Center of Temple University Libraries, Samuel L. Paley Library, 1210 Polett Walk, Philadelphia. Pennsylvania Abolition Society Records (digitized), Historical Society of Pennsylvania, 1300 Locust Street, Philadelphia. Quaker Meeting Records, Friends Historical Library, Swarthmore College, Swarthmore, Pa.
Quaker & Special Collections, Haverford College, Haverford, Pa.
African American Museum in Philadelphia, Seventh and Arch Streets, Philadelphia. Cliveden of the National Trust, 6401 Germantown Avenue, Philadelphia. London Coffee House (Historical Marker), Front Street south of Market Street, Philadelphia. The President’s House Site, Sixth and Market Streets, Philadelphia. Love your shared and valuable information. The world needs more of this type detail facts. Appreciation to you for all your research and efforts in bringing us your aggregated findings. where is John age 26 arrived as a servant with Henry Shelton. put to work in homes?